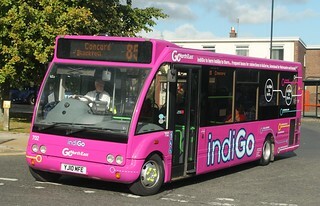 This vehicle has been fitted with Wi-Fi, partially meeting the standard specification of the newer "indiGo" branded Optare Solo SR M925/Optare vehicles which operate on "indiGo Washington" services 81/82/83/84. This vehicle has entered service at Washington Depot, on "indiGo" services 85/86. This vehicle has received "indiGo Washington" branding. It lacks the Wi-Fi and Next Stop Announcement feature 'blobs' as featured on the new Optare Solo SR M925/Optare vehicles which entered service earlier this year, as, unlike the new vehicles, it does not have either of these features. 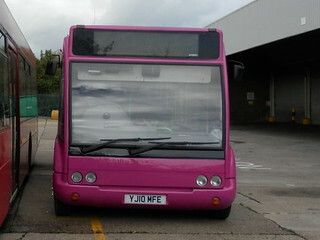 This vehicle has been repainted into a plain pink base livery. Once prepared for service; this vehicle will be allocated to Washington Depot, and the recently introduced "indiGo" brand will be expanded to encompass services 85/86. Since the withdrawal of Oxfordshire County Council subsidies on 20th July 2016, Thames Travel has been operating the Bicester Town bus services 22 and 23 on a commercial basis. These services run at a loss of approximately £4,500 per week and therefore this decision was a temporary arrangement, while Thames Travel continued discussions with several local stakeholders to pool existing finances and resources to safeguard the longer term future of the services. The company’s proposal included extended operating hours to better meet the needs of commuters using rail services, offering improved daily links to the new Park & Ride site and providing a frequent service between the town centre, two rail stations and Bicester Village. 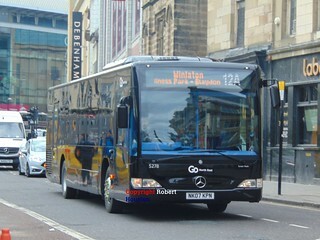 Unfortunately, while some stakeholders were supportive of the company’s proposals and were prepared to provide some funding for the services, others chose to pursue their own commercial interests and therefore services 22 and 23 were withdrawn from the end of service on Saturday 3rd September 2016. 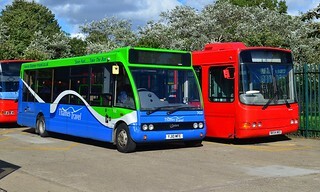 The Optare Solos allocated to these services are now hence surplus to requirements at Thames Travel, and have hence been acquired by Go North East, to allow for the withdrawal of further Transbus Mini Pointer Darts from the fleet. This vehicle was new to Thames Travel in May 2010 as fleet number 510 and was later re-numbered fleet number 702. As the Go-Ahead Group purchased the company in May 2011, it is currently fitted with non-standard Mobitec destination displays. These are planned to be removed prior to entry into service at Go North East. Presently unbranded; this vehicle has returned to service at Riverside Depot, where it will see allocation to services 12/12A (Newcastle - Winlaton). Having transferred to Deptford retaining "Route 19" branding, this vehicle has now been stripped of "Route 19" vinyls, and carries a plain white base livery as such. 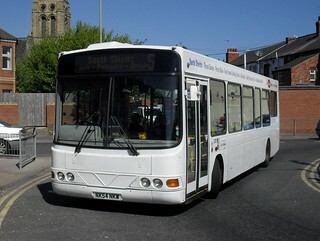 Unlike 8268 (NK54 NKU), this vehicle has retained the cant rail branding with the route details for service 19. 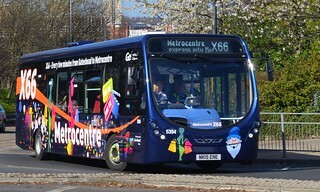 This vehicle has now entered service at Riverside Depot on "X66 Metrocentre" service X66.